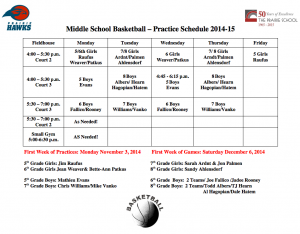 This winter we are excited about the large number of students that will be participating in our Basketball program. We have rearranged practice times to meet the availability of our coaching staff while keeping in mind our students’ academic needs and our families’ busy schedules. This year, each coach will have an email group, and they will communicate directly with you throughout the season. A practice day may occasionally need to change to accommodate home events in our athletic facilities. We have arranged an after school venue for your child if they have a late practice. Students should report to the Hilpert Room after school, and at 5:15 p.m. they will be dismissed to their practice in the Fieldhouse. There is no charge for this service. We encourage students to bring a snack to school or utilize the after school concessions in the Johnson Athletic Center. Families may choose to take their child home after school and return for practice. If you have any questions or concerns, don’t hesitate to contact us. This entry was posted in Athletics by Dori Panthofer. Bookmark the permalink.